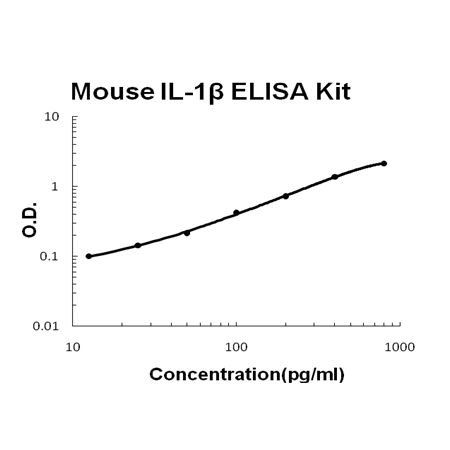 Sandwich High Sensitivity ELISA kit for Quantitative Detection of Mouse IL-1 beta. 96wells/kit, with removable strips. Secreted. The lack of a specific hydrophobic segment in the precursor sequence suggests that IL-1 is released by damaged cells or is secreted by a mechanism differing from that used for other secretory proteins. Interleukin-1beta(IL-1beta) is a potent stimulator of bone resorption whose gene is mapped to 2q14, and has been implicated in the pathogenesis of high bone turnover and osteoporosis. IL-1beta, a prominent microglia-derived cytokine, caused oligodendrocyte death in coculture with astrocytes and microglia, but not in pure culture of oligodendrocytes alone1. It also can cause nuclear export of a specific NCOR corepressor complex, resulting in derepression of a specific subset of nuclear factor-kappa-B(NFKB)-regulated genes2. Furthermore, Microenvironmental IL-1beta and, to a lesser extent, IL-1alpha are required for in vivo angiogenesis and invasiveness of different tumor cells3. Additional, the cooperation of IL-1beta and PDGFB induces contractile-to-synthetic phenotype modulation of human aortic smooth muscle cells in culture4. Moreover, the association with disease may be explained by the biologic properties of IL-1beta, which is an important proinflammatory cytokine and a powerful inhibitor of gastric acid secretion. Ascorbic acid ameliorates oxidative stress and inflammation in dextran sulfate sodium-induced ulcerative colitis in mice. Zhang W, Li X, Liu Y, Chen H, Gong J. Biomed Pharmacother. 2017 Apr 19;90:821-834. doi: 10.1016/j.biopha.2017.04.025. Activation of imidazoline I1 receptor by moxonidine regulates the progression of liver fibrosis in the Nrf2-dependent pathway. A: There will be some unspecific staining in hemolysis samples and make the result inaccurate. We suggest you collect plasma samples again, hemolysis samples are not recommended to use.